There have been many requests from troop leaders asking how they can get patches for their own workshops. ​If you want to order patches, you'll find that information here. Please Note: There are currently no patches available. I plan to find a new vendor in Canada to produce additional patches, though I daresay the design might be a little different (given I'm in Montreal rather than San Diego). I'll post more information once it's available. How Can I Get Some Patches? Dungeon Scouts is able to provide patches to interested leaders and parents. This ultimately depends on how many patches are on hand at the time of your inquiry. If you would like to order some patches for your own workshop, please contact Dungeon Scouts using the form here. There is a $3 donation required for each patch ordered. The money from this donation is used to order additional patches, purchase workshop materials (such as dice, dice bags, paper/card stock, printing services, etc.). Additionally, a third of this money is donated directly to SHARE. Payment details can be discussed, but are usually handled via check (sorry, but Dungeon Scouts doesn't use PayPal). Shipping is typically included, though in the case of large or international orders you may be asked to pay whatever the shipping charges turn out to be. All patches are sent via the US Postal Service. As this is a one-man operation, orders are typically mailed within a week of your donation's receipt. Is This a Badge or a Patch? Though this was originally intended to be a badge program, discussions with San Diego Girl Scouts in late 2015 revealed it can only be offered as a patch program. While this was initially disappointing, it isn't important to Dungeon Scouts' ultimate objective: to introduce girls to the Tabletop Role-Playing Game hobby so they can learn about and enjoy it for themselves. The designation of this award as a patch or badge is secondary to the outreach we all perform by putting dice into the hands of potential players. Ultimately, the TRPG patch is whatever we want it to be, to be displayed proudly by our scouts in any way they feel appropriate. That said, Dungeon Scouts continues to strive for recognition of our program, both at home and in councils across the country (and beyond!). Can I Get Patches Without "San Diego" on Them? 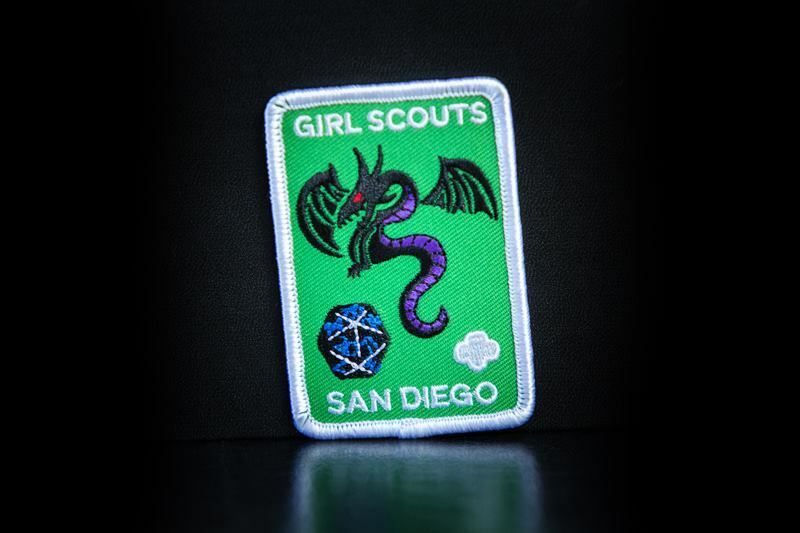 All the patches Dungeon Scouts orders have "San Diego" embroidered on them. This is due to the fact that a council must be identified on the patches. It may be possible for you to order your own run of patches from the manufacturer using the Dungeon Scouts design, only with your council specified. If this is something you'd like to look into, please use the contact form and inquire. ​Be aware that the manufacturer's minimum order is 100 pieces. Can I Order Other Materials from You? That depends on the materials you're looking for. Dungeon Scouts has helped other troops and leaders by providing small quantities of dice and dice bags, though this is determined in large part by what is currently on-hand. At the very least, we can give advice on ways to find low-cost dice and other materials.